It’s that time again! “What time is it?” you may be asking. Well, the time for once again getting healthy, naturally grown, non-pesticide, inexpensive vegetables lovingly grown and tended by the Good Samaritan Health Clinic (GSHC) Farmer’s Market Team: Farm Manager, Cody Burnett, Farm Assistant, Nobe Ennis, and Community Outreach/Farmer’s Market Manager, Anthony Wilkes. Personally, I was so thrilled and ecstatic when I started coming to GSHC for medical services in late 2016 to see the garden on the premises. In fact, I had been praying for quite a very long time (years, in fact) and researching community urban gardens near me that I could join, with no results. There was a major personal reason for my profound gratitude for the blessing of this answered prayer. My Mother, Ordained Methodist Minister, Rev. Mercy Mwazwiwanza (Mujati) Kasambira had always been a gardener ever since she was a little girl in Mutambara, Zimbabwe, Africa and I grew up fascinated as I watched in amazement at how she could turn ANY piece of property into a “Garden of Eden.” When she “went home” due to a freak car wreck in 1995 at age 62, I (as was my entire family) was totally devastated. She had been my Spiritual Rock. At the time I had been homeschooling my three young children in Houston, TX. Another homeschooling family in our support group started an educational farm to learn how to grow vegetables organically. It was called Heritage Farms. Each family was given the opportunity to have as many 200-yard row plots as they chose to tend from starting the seedlings to the harvest. This became a therapeutic life-saver for me to deal with the grief of our Mother’s death. Therefore, when I saw the farm on my first medical visit to Good Sam, I immediately knew that my prayers had been answered. That first visit I asked a staff member how I could sign-up as a volunteer to occasionally work on the farm. As it was late in the year when I first signed up, it was way too cold for me to actually work out there (I have never been able to handle the cold weather). This is another reason I so appreciate Cody and Nobe for their dedication to run the farm no matter what the weather conditions. However, I found a way to support the farm by purchasing the produce for myself as well as sharing the bounty with others who have been SO BLESSED also. Now that the 2018 harvest has started again, I have had the AWESOME joy of once again seeing the smiles of joy and appreciation as I deliver the delicious and wholesome produce to friends and neighbors and spread the good news about Good Samaritan Farm and Market. Another added economical feature provided by the farm is that, if an individual is on SNAP (Food Stamps), they can receive double the amount of produce. Can’t beat something like that! Talk about savings! 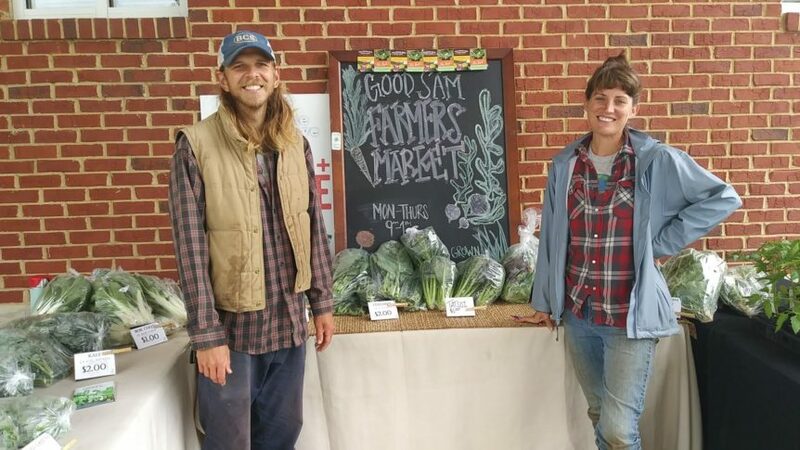 In keeping with Good Sam’s mission and overall holistic approach to healthcare, the GSHC has established a program where a qualified patient can receive a “prescription” to receive produce from the farm to assist in their continued health goals. Volunteers are always welcome by providing individuals, as well as, groups the opportunities to support Good Samaritan and, thus, the whole community at large. Did you find YOURself in one of these categories? Well, what are you waiting for? Look forward to hearing and seeing you SOON! !